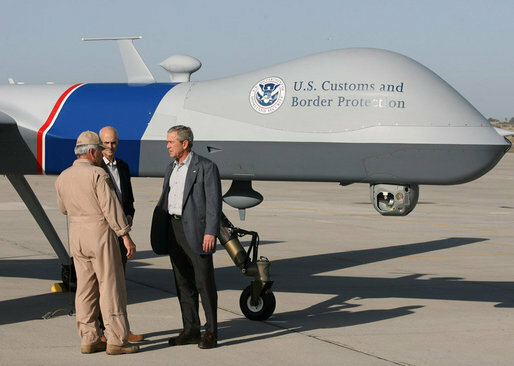 Former President George W. Bush standing next to a Predator Drone in 2007. White House photo by Eric Draper. On a monthly basis, the US military collects over 10,000 hours of footage from Predator Drones that needs to be watched an analyzed. The Warholian challenge of sifting through the amassed footage and waiting for a moment of interest to the intelligence community has overburdened the military's viewing capacity. The load is only expected to increase with an over-extended drone program at the US-Mexico broder and the introduction of enormous new surveillance suites in Afghanistan and beyond. The volume of footage exploited in a reality TV control room, the report states, “is comparable in scale” to what an Air Force ground station processes. Operations in both scenarios run 24/7, with operators required to “record and report events in near realtime.” And in both settings, footage can be mundane for hours on end — until unusual or important events occur unexpectedly. The report's main suggestions focus on the layout of logging stations, where footage is analyzed. Reorganizing Air Force ground stations to resemble reality TV control rooms could optimize the analysis of surveillance video. The most interesting advice from the report, though, focuses on the techniques producers utilize to spin masses of footage into the narratives of shows like Jersey Shore. RAND touts the benefits of a multimedia database by noting that, "The editors who ultimately exploit this footage do not rewatch all or even most of it; they instead rely heavily on the live logging notes taken during filming to sift through the footage and produce the narrative. The multimedia databases or digital asset management systems that facilitate this are effective at handling this amount of data and are commercially available." In other words, the organization of footage (the ability to "tag" it) would ensure that the military could make use of all its raw drone footage by separating analysts from people who simply catagorize the footage. Analysts would be the ones who know where to look, while "taggers" would simply live-log the footage into a searchable database. Other suggestions include implementing chatroom-based communication among footage viewers and creating stations to focus on specific locations, as opposed to one centralized viewing room for all collected footage. While the military doesn't have the benefit of a loose script to guide their viewing habits, they do have their own expectations of what they're looking for. It's a pattern distinct from a knowing glance between Khloe and Kourney, but a pattern nonetheless. Furthermore, if drone surveillance rates increase, as they're expected to, and more reality television production techniques are implemented in data analysis, rising rates of Truman Show delusion may not seem so outlandish afterall.